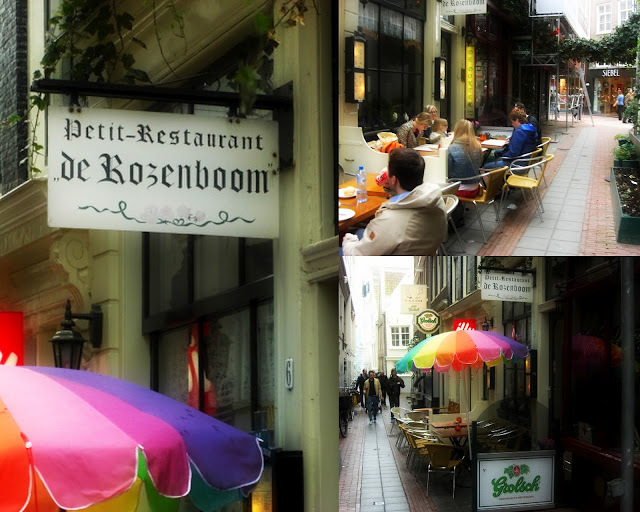 We came across this cute restaurant on our last day in Amsterdam. It was located on a random side street within the shopping district! It was a nice day (except for a bit of rain) so we sat outside to take in the city at it's finest - sipping on koffie verkeerd's and dipping out fries in mayo. I was absolutely in love with this restaurant, from the hospitality to the delicious food (everyone agreed it was the best of the trip), everything was amazing! The interior was just as creative, decorated with delft blue plates and wooden tables/ chairs giving it a rustic look. There were about four flights of stairs each taking you to another section of the restaurant, so even though it looked small from the outside it could really hold a lot of people! I wish I could revisit soon, it's definitely a place I would go back to in a heartbeat (and not just because it's in Amsterdam, although that helps too). If you're ever looking for a great spot in Amsterdam, look no further!